Bond Economics: Primer: What Is Breakeven Inflation? 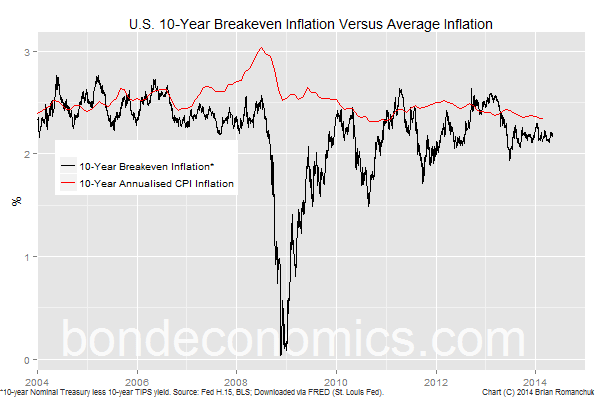 Primer: What Is Breakeven Inflation? The breakeven inflation rate is a market-based measure of expected inflation. It is the difference between the yield of a nominal bond and an inflation-linked bond of the same maturity. Since investors' money is on the line, they presumably have an interest in pricing inflation correctly. It is viewed as a more reliable measure of inflation expectations than those measured by surveys. In this article, I explain how this concept is used in bond market economic analysis. 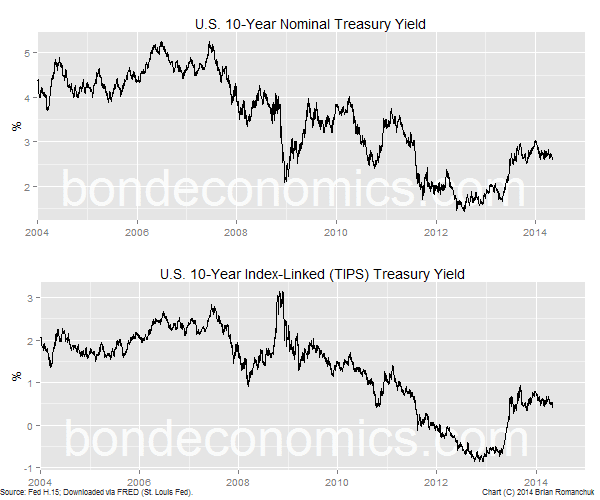 I will illustrate my discussion with data from the U.S. inflation-linked bond market (known as the TIPS market, where TIPS stands for Treasury Inflation Protection Securities). Inflation-linked bonds are also known as index-linked bonds, or even "linkers". Other sovereigns have issued similar bonds, and they mainly have a similar structure. The original (modern)* index-linked bonds were issued by the United Kingdom, and they thus have the longest run of available data (since the early 1980s). The problem with the U.K. market was that the design of the index linking was such that analysing them is very difficult, and the pricing rules of thumb I discuss here do not apply to those bonds. (At one point when I wanted to look at the pricing formulae for those bonds, even the U.K. Treasury was unwilling to print out the full calculation formula in one of their guides since the formula was such a mess.) Canada introduced a cleaner design for index-linked bonds in the early 1990s, and the "Canadian Model" was followed by most other sovereigns that started issuing index-linked bonds (including U.S. TIPS). For readers who are unfamiliar with index-linked bonds, the primer: "Understanding Inflation-Linked Bonds" gives an introduction to how the bond design gives investors a total return that is protected from inflation. This section is a summary of the points in that article. $1 of coupons (paid semi-annually, or 50 cents every six months), where the $1 is in "2014 dollars". The amounts are indexed to inflation, or $1*CPI(t)/CPI(2014). $100 principal payment at maturity (2024), which is also in "2014 dollars" (so you receive $100*CPI(2024)/CPI(2014)). Inflation-linked bonds therefore allow you to create retirement cash flows that are indexed to inflation. The chart above shows the yields of generic 10-year U.S. government bonds. 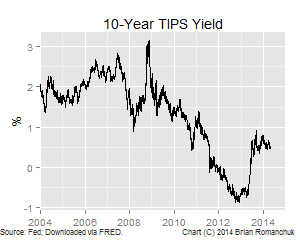 Since having your cash flows indexed to inflation is valuable, the quoted yield on TIPS are generally less than on regular ("nominal") Treasurys. Most people refer to the yield on TIPS as being the "real yield", although that conflicts with the definition of real yield that is often used in economics (which was developed before inflation-linked bonds existed). 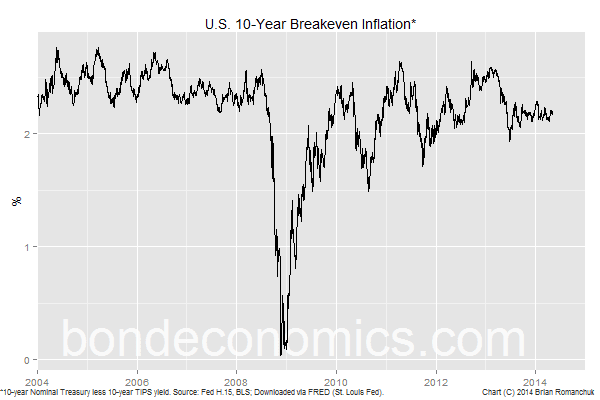 10-year breakeven inflation rate = (10-year nominal Treasury yield) - (10-year TIPS yield). It is called the breakeven inflation rate because you would (roughly) receive the same total return on TIPS as you would a nominal Treasury if CPI inflation averages that level over the next 10 years. Note that this estimate break-even rate will be slightly off for bonds trading away from par, and does not take into account things like the difference in financing costs. The true economic breakeven will be even further from this spread for shorter maturity bonds, for reasons I discuss further below. For example, the Fed H.15 data for the end of April had the 10-year nominal Treasury at a yield of 2.71%, and the 10-year TIPS yield at 0.53%. The difference between those values was 2.18%, the 10-year breakeven inflation rate. Therefore, you would be indifferent between owning TIPS and Treasurys if you expect CPI inflation to average 2.18% over the next 10 years. If you think inflation will be higher, you would prefer TIPS, and nominal Treasurys otherwise. As an aside for those of you who write about the markets. The breakeven is a spread between bonds, but the convention is to quote it as a percentage, and not in basis points. This is because you typically compare the breakeven to the level of inflation, which is an outright percentage. If you are interested in relative performance over a period shorter than the maturity of the bonds, the performance of inflation versus the initial breakeven rate is not enough to tell you about relative performance. You also need to take into account the relative pricing at the end of your horizon. For example, even if inflation is higher than the breakeven rate over the next year, TIPS could underperform if nominal yields fell versus TIPS yields. This is the same as other fixed income valuation measures like yields or spreads. They are expressed on a hold-to-maturity basis, but there is no guarantee that returns over shorter periods will match the hold-to-maturity average. There are at least a half dozen factors that could each plausibly raise or lower the breakeven expectations by 10-50 basis points each under normal circumstances (things went haywire during the crisis, and all risk premia blew out). If you added the uncertainty up, the breakeven could theoretically be either above or below the "true expectations" by 100-150 basis points. Nevertheless, my feeling is that the fixed income markets are too yield-starved to allow such a situation to develop, and there is a practical upper bound to the deviation between the breakeven and "true expectations" of about 50 basis points. For what it's worth, my reading of the market is that the 10-year TIPS breakeven inflation rate normally trades about 20 basis points over the true expected rate of inflation. I will cover the other factors that affect the breakeven inflation rate in future articles. During the crisis, the TIPS market broke down. I would argue that although the 10-year breakeven inflation rate dropped to about 0% at the end of 2008, no major market participants expected no inflation over the following 10 years. Rather the situation was that very few investors had the capacity to buy them, and everybody knew that there was a lot of forced selling to come. Therefore, there is no point trying to line up the breakeven inflation rate with inflation surveys at that point in time. The TIPS market came into existence during an era of inflation stability. Although the Fed does not have an official inflation target, it has been acting since the early 1990s as it has one. As the chart above shows, 10-year annualised CPI inflation rate has been steady at just above 2% for most of the last decade. Since headline CPI is used, the spike in gasoline prices in 2008 managed to get the 10-year average inflation rate to 3% temporarily. One of the nuisances of pricing TIPS is that they are based on non-seasonally adjusted CPI. For calculations involving fitted bonds with an exact number of years to maturity (such as I do above), seasonality does not matter. But for actual bonds in the market, most of the time there is a non-integer number of years to maturity. This means that the time of year in which you buy does not match the time of year of the maturity. 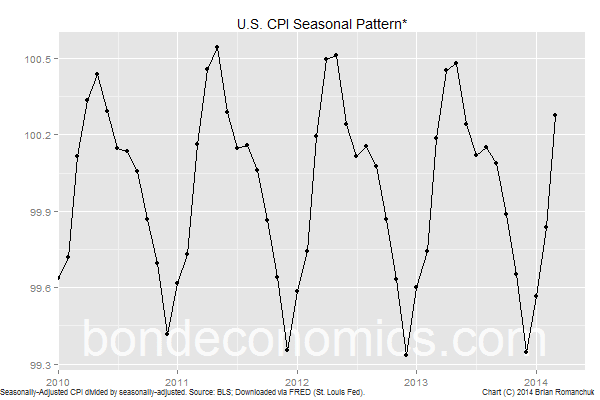 The chart above shows the seasonal pattern in the CPI index. It is calculated by dividing the non-seasonally adjusted CPI by the seasonally adjusted version (and multiplying by 100). The seasonality factor dips down to about 99.3, and reaches 100.5. That is a difference of 1.2%, or 120 basis points. Although this does not sound like a lot, this change is compressed into a period of 4-5 months. This creates an annualised rate of change of a few hundred basis points. For short-dated bonds, this factor can have a large impact on the true economic breakeven between TIPS and nominal bonds. As a result, you can get some extremely weird-looking yields on short-dated TIPS, even though there are no unusual factors in inflation. If you are a retail investor who invests in Exchange-Traded Funds, and you want to know how to judge whether an inflation-linked bond ETF will outperform a nominal bond ETF, all I can say is - good luck. Even if I had access to all the relevant pricing information (which I no longer do), I would despair at trying to calculate the true economic breakeven. ETF's represent baskets of bonds, and it is hard to maturity match between them. Moreover, the constituents change continuously, so you would need to make assumptions about how the bonds are rolled over. About all you can do is look at the indicative breakeven inflation rate at a few benchmark maturities, and use that to make a judgement call on overall relative valuations. * There existed bonds whose payouts were linked to commodities hundreds of years ago; these were the forerunners of modern inflation-linked bonds. ** The option models used for foreign currency bonds were adapted to be used on inflation-linked bonds. An article discussing how breakeven inflation is sensitive to yields -- "directionality." Erratic carry means that breakeven inflation matters, not the real yield. My medium-term Canadian inflation outlook. Hi Brian, good article, well explained. Would you be able to run the calculation for me on the formula your provided: "$1 of coupons (paid semi-annually, or 50 cents every six months), where the $1 is in "2014 dollars". The amounts are indexed to inflation, or $1*CPI(t)/CPI(2014). I am not sure what (t) means. Even this one: $100 principal payment at maturity (2024), which is also in "2014 dollars" (so you receive $100*CPI(2024)/CPI(2014)). Maybe you can use dec 2016 as the maturity date of the bond just to show the calculation. BTW: I am buying one of your books, maybe two. Thanks. I realise now that I should put an example of the cash flows in the text itself, or else have another article with how the cash flows work. Therefore, if the base is October 2014, then the adjustment factor for October 2016 is 1.0181 (rounded). Therefore, a $100 "2014" cash flow then would actually be $101.81. Anyway, thanks for reminding me about this topic!